The epidural steroid injection is the placement of cortisone, a powerful anti-inflammatory agent, into the epidural space, which approximates the disc and spinal column. The epidural injection has been used for over 40 years as treated for back pain. It involves using either steroids or anesthetic agents allowing good benefits with minimal risk factors. 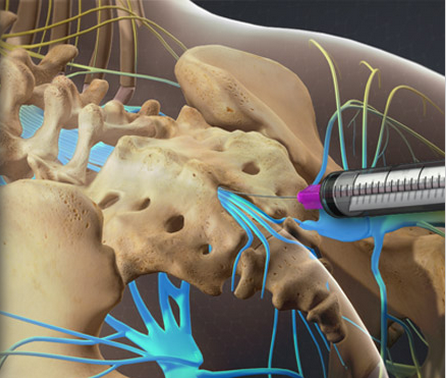 The main goal of the epidural injection is to shrink the swelling in bulging or herniated discs, and to decrease any inflammation that surrounds the disc and may be pressing on a spinal nerve. This is a common procedure. Because of the low risk and low incidence of any significant problems or side effects, it is felt to be a reasonable procedure to follow when traditional conservative therapy for disc pain has failed to provide improvement. A large percentage of patients upon whom this procedure is performed will get complete resolution of symptoms; a small percentage may experience no real improvement at all. It is generally an accepted practice that this procedure be repeated up to three times within a few months, although in some cases, additional injections may be administered. Injections may be given as a single dose, or once a week for up to three weeks. Additional injections have additive effects. Side effects and adverse reactions are rare. Some of these potential (uncommon) side effects include fluid retention, “puffiness”, and rarely acne. An additional risk is the possibility for the epidural needle to nick the dura (the covering of the spinal cord). Should this occur, there could be leakage of cerebrospinal fluid, which could cause a severe “spinal headache”. If this should happen, bed rest and an increase in fluid and caffeine intake frequently will alleviate the headache completely. Should this not resolve the problem, it could be necessary to do what is called a “blood patch” in which (under sterile conditions) blood is removed from a vein in the arm and placed in the same epidural space. This completely resolves symptoms of the headache. The incidence of a spinal headache is approximately 1 in 1,000, and occurs in a patient about once every year. As you can see it is very rare. Since this is the most common adverse event that may occur from epidural injections, the remaining potential complications should not worry you, but make you more informed. Other potential risks include: worsening of symptoms, bleeding infections, backache, steroid side effects, bowel or bladder dysfunction, hematoma, cord compression, paralysis, neurological damage or impairment, or death. One of the most serious side effects (which is extremely rare) is the developing of an epidural infection or abscess. In order to avoid these complications, the procedure is done under strict sterile conditions, utilizing fluoroscopy to localize the epidural space and guide the needle. Patients are advised to rest on the day of the epidural, although bed rest, while preferable, is not required. By the next day, previous activities can be resumed. An occasional patient will feel such significant relief that they are tempted to resume various strenuous activities. They are cautioned not to do this, however. It is generally advised to pursue a course of gradual increase in activity. Often coordinated with physical therapy or other training once the injections have been completed. Patients are usually seen 3-7 days following the procedure for a follow-up exam, to evaluate their response to the steroid epidural(s).